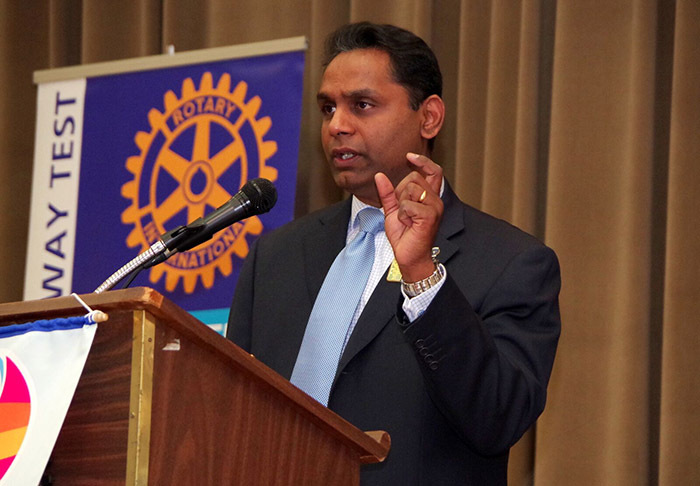 Guest speaker Rakesh Naidu, President of the Windsor-Essex Regional Chamber of Commerce, spoke about the current Windsor-Essex business landscape and opportunities. Club celebrated Walter's 85th Birthday and learned about new member Mardrick Rogers, as part of the "This Is Your Life" Series. This past Monday, the Club celebrated with Walter, honouring his 85th birthday with cake, balloons and the usual “Happy Birthday” singing led by Bill Wilkinson! Marcela Diaz led us through the Invocation, Nick Bibic helped us recite the 4-Way Test and David Langford explained the environmental fact: Kopegaron Woods, located on Highway 3, between Leamington and Wheatley. We heard new member Mardrick Rogers speak as part of the “This is My Life” series. He was born in Sierra Leone, West Africa and migrated to Canada in 1975 (when the civil war began in his home country). He has been an active member of many organizations, including The African Community Organization of Windsor, Knights of Columbus Holy Family Council 4386 (South Windsor), Windsor West-Indian Association (where he won an award for his years of dedicated service and contribution) and was a founder of The Sierra Leone Association of Windsor Ontario. Rakesh Naidu, President of the Windsor-Essex Regional Chamber of Commerce began his presentation with his Rotary connections: He attributes much of his success to his Rotary experiences in both District 3060 (including UT Daman, Diu, part of the states of Gujarat and Maharashtra in Western India) and District 1660, Paris (and Île-de-France West). He even sported the Rotary pin he got from Rotary Club of Jawaharnagap and showed the Club the banner he received from Rotary Club of Dourdan (France)! Mr. Naidu spoke about the importance of the Chamber in Windsor-Essex. He discussed the current Windsor-Essex business landscape, detailing the industry clusters of Automotive, Logistics, Automation, Agri-Food and Health Science. He touched on some of the challenges our region faces, including the elimination of the 3rd shift at FCA assembly plant, lack of industrial and commercial landing space and others, but also looked at the many opportunities we have, such as diversification in different sectors, transportation and logistics, construction, agri-business and more. Janet showed the award our Club received from the Essex Region Conservation Foundation for “Outstanding Corporate Contribution”, which she accepted on behalf of the Club at the Essex Region Conservation Foundation AGM held on March 27th.